About College : Indian Institute of Technology Madras is one among the foremost institutes of national importance in higher technological education, basic and applied research. In 1956, the German Government offered technical assistance for establishing an institute of higher education in engineering in India. About College : The College of Engineering, Guindy in Chennai, India, is India's oldest engineering and technical institution, having been established in 1794. Today it is one of the four constituent colleges of Anna University. About College : Sri Sivasubramaniya Nadar College of Engineering, popularly known as SSN, is an engineering institution located in Chennai, Tamil Nadu, India. The college is certified to ISO 9001:2000 standard by the National Board of Accreditation. About College : The SRM University is a co-educational private university in the state of Tamil Nadu, India. It was founded in 1985 as SRM Engineering College in Kattankulathur, under Anna University. About College :"EASWARI ENGINEERING COLLEGE " (EEC) , a Division of Sri Ramaswamy Memorial Group (SRM GROUP) of Educational Institutions for higher Learning, is functioning under the aegis of Valliammai Educational Society, since 1996. The Society was founded in the year 1975 by Thiru.T.R.Pachamuthu, a well-known Teacher and Educationist, for promoting the cause of Education. 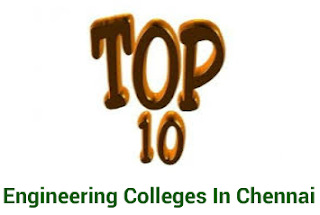 About College :"Sri Sairam Engineering college is an engineering institution located in the suburbs of Chennai, Tamil Nadu, India. The Institution earned ISO 9001:2000 Certification from Bureau Veritas Quality International. About College :B.S. ABDUR RAHMAN CRESCENT ENGINEERING COLLEGE is acclaimed throughout India for its quality in teaching and research. Being one of the largest engineering colleges in India it lays emphasis on innovative research, investment in high-quality facilities and first-rate infrastructure. Also no fewer than nine of our departments are rated very highly.